Lighting up a bowl of weed is about as good as it gets! There are plenty of lighters available to pick from—just as there are plenty of pipes as well. Some lighters run on butane, but more and more lighters are leaning toward electronic construction that recharges on a USB cord. Fact is, you need to make a decision about staying old-school or going high-tech. Today, we'll look at the different styles of lighters. tips on refilling lighters and which are the best lighters for weed. *Keep reading for a full buying guide or jump straight to the reviews! There are a few things to look for in a lighter for weed. First of all, you need to consider the amount of lighter fluid it uses. If you have a smaller lighter, it might not have much lighter fluid, so it might run out of juice after a short period of time. Additionally, you might have to consider the design on the lighter. Some designs attract more people, so it might be more likely that someone steals the lighter from you in the long run—we all have that friend. So, you might want to think about buying a simplistic, ugly lighter in case someone steals it. This statement is especially true of more expensive lighters. Not to say that lighters with designs cost more, but some of the fancy rechargeable, refillable lighters can set you back a pretty penny. For example, you might want a Zippo lighter, and they often come with nifty designs. You might be a little more than upset if someone steals it from you because of how much it cost. This theft can be totally unintentional, though. We've all accidentally slipped an extra lighter or two in are pocket after playing smoking games with our friends. At the same time, you will want to consider ease of use. Some lighters require a spinner and flint to be used, but others are flip buttons. Deciding on which one to go with is completely up to you. There are a few, different types of lighters you can use for smoking weed. 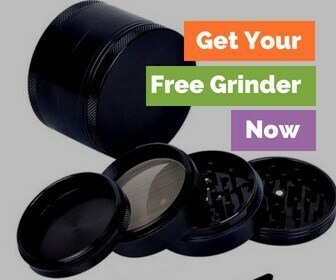 First of all, there is a standard spin-wheel lighter. These lighters are used by spinning a wheel to ignite a flint over top of the butane lighter field. Pushing the button under the wheel is what triggers the butane supply. Another option is the push button butane lighter. Instead of spinning a wheel, all you need to do is push the button, and a flame appears. These lighters come in different sizes to pick from, and the larger the lighter, the larger the button. A third option is a Zippo lighter. These lighters are known in movies for their fun, rhythmic way of flipping the lighters open and closed. Zippo lighters must be opened up before using a spin-wheel type mechanism. If you take the time to learn some cool zippo tricks, you're sure to be the life of the party! Finally, there is the long-nosed lighter. For smoking weed, these lighters are a little impractical because of their long, extended nose where the flame comes out. Most people use these for candles and lighting grills or firewood, after all. People who use a Zippo lighter or another type of refillable butane lighter might struggle during the refilling process to not make a mess. After all, butane is highly flammable, and to make a mess with it can lead to potential fire hazards. In most cases, you might need to use an adapter to properly pour in the liquid. Not all butane lighter brands are made the same, so having an adapter might be necessary. Using one of these adapters makes it easy to pour the fluid without making a mess. These adapters act much like a funnel to put butane back into the lighter’s reservoir. However, you should refrain from using a plastic funnel. The butane might eat away at the plastic or silicone and cause a nauseous gas to fill the area where you're working. Most of these adapters are made from metals similar to the ones used in the lighters themselves, so they are safe to use. You can also perform a neat trick with a disposable lighter empty of butane. 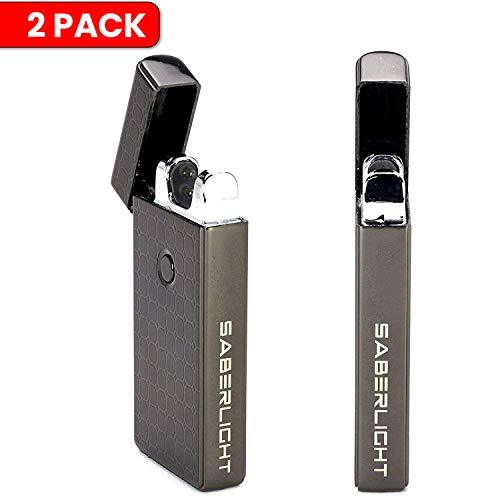 First of all, the bottom edge of one of these lighters can be used to pop open a beer bottle or soda pop bottle. 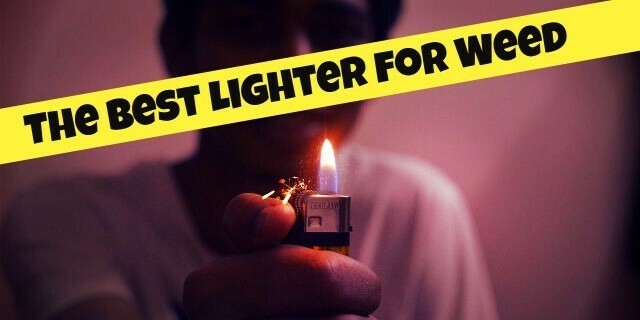 The reviews of the five best lighters to use when smoking weed. 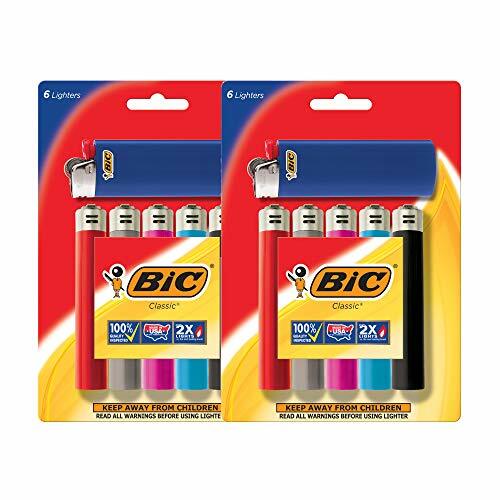 BIC lighters are some of the most popular lighters out there. After all, to have a lighter stolen from you is to be “BIC-ed” for a reason. While the packaging and colors may vary with these lighters, the brand itself is extremely dependable. BIC does not just sell their lighters in a pack. They sell many lighters on their own, and some of them come with different, interesting designs. These lighters are made either in the USA or France, so a lot of control goes into the production of this product. Some safety measures go into this brand of lighter. First and foremost, it comes with features to make it safe around children. Small fingers are not likely to operate the control on these lighters, so an accidental fire is not likely to be started by children. However, this system is not fool proof. Some children are rather smart, and they might figure out how to use the lighter—plus, act like we don't pop the safety off right away! So, you need to keep a close eye around children when one of these lighters is present. BIC also provides extra-long lasting quality with this lighter. While they do not provide as much butane as the situation sounds, the way the lighter burns the butane is what really makes it last for hours on end. 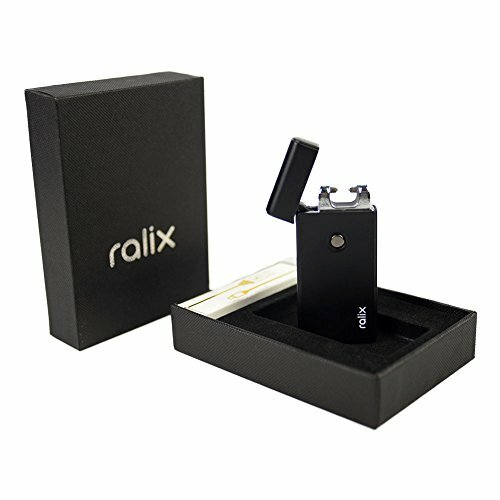 Ralix offers a one-click, single arc lighter that runs on electrical mechanics. This lighter charges off a USB port and cord. It is also wind resistant, so it will not go out in a strong breeze. At the same time, the Ralix model consists of zinc alloy, which will not melt or fall apart. Therefore, it operates much better than most plastic lighters. Because of the electronic mechanics, this model will light every time, so long as this battery remains charged. Most charges last for about a week or more, so it does not need to be charged all that often. Sparq by Saberlight features a plasma beam torch in the form of a lighter. This model has been redesigned for the sake of being used with a wider range of situations. Lighters like this are perfect for cornering your bowls allowing you to take more green hits! While most plasma beam lighters limit themselves to certain applications such as bowls and pipes, this model goes above and beyond the call of duty. All you have to do is apply the plasma field until the surface becomes completely lit. If you happen to be a fan of Star Wars, then you will feel closer to using the technology found in the movie by using this lighter. One of the greatest things about this lighter is the fact that it does not use butane. Hence, you do not have to worry about refilling it with fluid. Additionally, this lighter can also be recharged for later use once energy runs out. 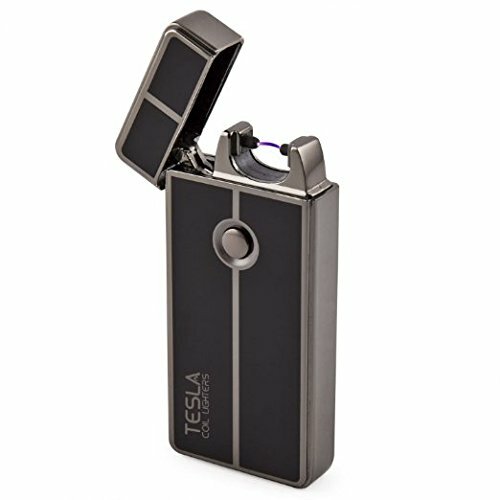 Tesla makes many things, and one of the prime items they manufacture are the Coil Lighters. As with previous electrical component lighters, this one is wind resistant. Therefore, you can use it whenever you please, despite a cold or warm breeze. It will not light up so long as the lid is securely in place. Therefore, you are not likely to light your pockets on fire, especially since a button needs to be pressed to ignite the flame. Furthermore, it can be recharged through USB cables and ports. These Official Clipper Lighters have removable flint housing. They can be refilled with butane as needed. At the same time, the flints can be replaced once they run down as well. The removable flint housing also doubles as a poker tool when it comes to rolling papers. It comes in a six pack of random colors to pick from. Packaging varies, and the same set of colors are not always guaranteed for each batch. You might also find other places to use this lighter instead of just for smoking. It makes a great tool to have around the kitchen. At the same time, it provides great access to heat while trying to light a fire in a fireplace or woodstove. When it comes to finding the right lighter for weed, you don't need to concern yourself with looking at other brands. And if you're wondering why Zippos didn't make our list, it's because the taste of butane is too harsh when smoking weed—yuck! The five options listed here are the best ones to pick from to spark up a joint. 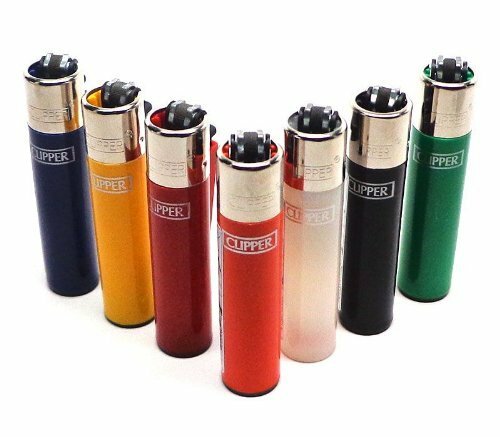 Which one do you think is the best lighter for weed?